The landing page of a PPC campaign can be considered one of the most important aspects to a campaign because in some ways it determines whether the campaign will be successful or not. It is the factor which decides if the campaign is successful in terms of conversions as it is on the landing page where visitors will have to perform an action you want them to do. Just think: you could have made an amazing PPC campaign but if your campaign ‘falls at the last hurdle’ being the landing page, all the hard work of gaining targeted visitors for low prices may be all for nothing. For this reason, you need to pick a landing page which will prove successful to your campaign. Once you have done this, you will can then think about adding social media sharing buttons to oyur landing page. 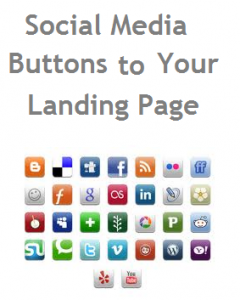 By putting social media buttons on your landing page will give you the benefit of two traffic sources instead of one. First you will have your actual campaign’s traffic which is the paid traffic to your landing page. This traffic will be more targeted for your keywords and campaign producing better results. The second source of traffic comes from those visitors (that came from clicking on your advert) that shared your landing page with social websites bringing referral traffic to your landing page. This traffic, although is sometimes unreliable (as it depends on if your visitors decide to share the page or not), is traffic to your landing page. Every advertiser wants as much traffic to their landing page as possible as the more traffic, the more chances of successful conversions. Therefore, the more chance the advertiser will make money. Social media is an extremely good way to promote your landing page too and can work well alongside a PPC campaign. I have already described in a previous article how social media can benefit your PPC campaign. The benefit from that article that should stand out the most is the fact that social media traffic is free. You won’t be at any disadvantage if you put social media buttons onto your landing page and don’t get any traffic. It’s risk-free. This is why I believe you should use social media buttons on your landing page. It’s free and can help your landing page go viral and gain traffic. You will also find it harder for social media users to identify your landing page as an advert on the social media websites too. Sites such as Twitter and Facebook disguise adverts so they are not in the stereotypical format making it difficult for users to notice it as an advert. For example, an advert in Twitter can look like a simple tweet with a link attached. This will increase the chances that your landing page will get clicked on when shared by your PPC campaign’s visitors socially. Share your comment 1 responseTO Add Social Buttons to Your Landing Page.